The Shammy Moo team had a great time at the Ulster Rally, a round of the British Historic Rally Championship, last weekend, spurred on by a star performance from the service crew, good company and weather and the warmest of welcome by the people of County Antrim. The Friesian Racing herd were joined by Geoff Taylor and Steve Greenhill and their 2011 BHRC class winning Imp. Nigel and Henry were supported by Mike Dent and Keith Livesey. Whilst the 2 car crews were out doing the ‘recce’ (2 passes of 10 different stages from 09:00 to 22:00) on Thursday, the service crew were setting up in the service park and putting the cars through noise test and scrutineering. Unfortunately on his way back from scrutineering, Mike was gently going round a roundabout when Shammy Moo made a loud bang from the transmission. We have now found out that the diff carrier broke in two and one section rode over the other causing a split in the diff housing case. Nigel and Henry were out of mobile range near Ballycastle and before they knew anything about it Mike and Keith had the transmission pack and engine sitting on the ground ready to fit the gearbox that Geoff had fortunately brought along. In heavy rain they had the car running again at 01:30 on Friday morning just as the generator petrol ran out! What stars! 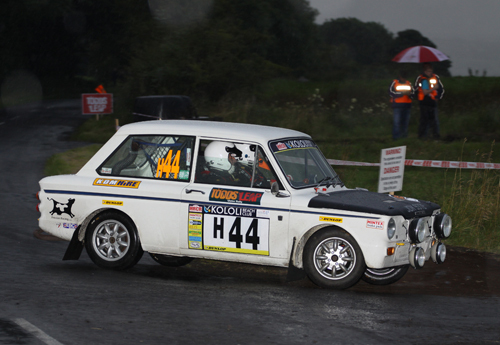 Next day Geoff went off in blistering pace, using the knowledge of the roads gained from the rally in 2011. On stage two, the very twisty, narrow and infamous Torr Head (if you want a flavour look at the Rob Smith’s Torr Head YouTube video) he overtook a 911 on the stage. Nigel’s times improved during the day and got close to the times of the Porsche that Geoff ‘Imp’d’. On stage one he had total brake fade (EBC Yellowstuff on the front) due to insufficient attention to the heat cycles when running them in. The next stage they were back to normal once they started smelling! Otherwise Shammy (having had its hiccup the day before) ran perfectly although minor things needed attention at service throughout the day. 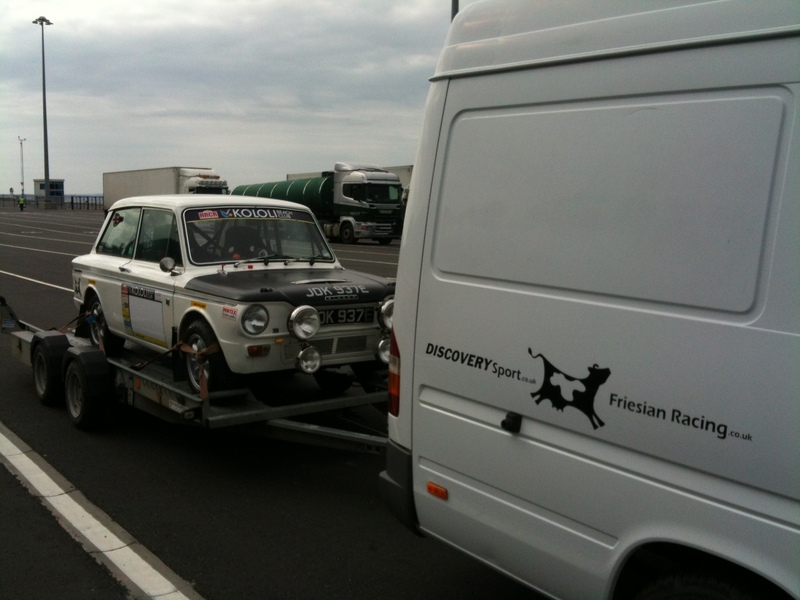 Geoff, when running so well, sadly had a problem immediately after the Lisnamuck 1 stage when the end of the outer drive shaft sheared at the spline and a wheel disappeared into a hedge. This episode 2 minutes earlier would have been very serious. Both cars fortunately chose to throw their ‘wobblies’ at perhaps the most convenient moments! Sadly this was the end of the event for Geoff. Nigel continued to improve (Henry said he started to ‘get on it’ over the last three stages) and we ended up first in class and 5th overall in the Historic class (pre 68) which we were well satisfied with. Our first real points in the BHRC has put us in 31st place in the championship. A truly memorable event, made possible by dedicated and enthusiastic service crew. At last we should be out with Shammy Moo, our historic Singer Chamois rally car, at the Pirelli Historic Rally on Saturday 28th April. 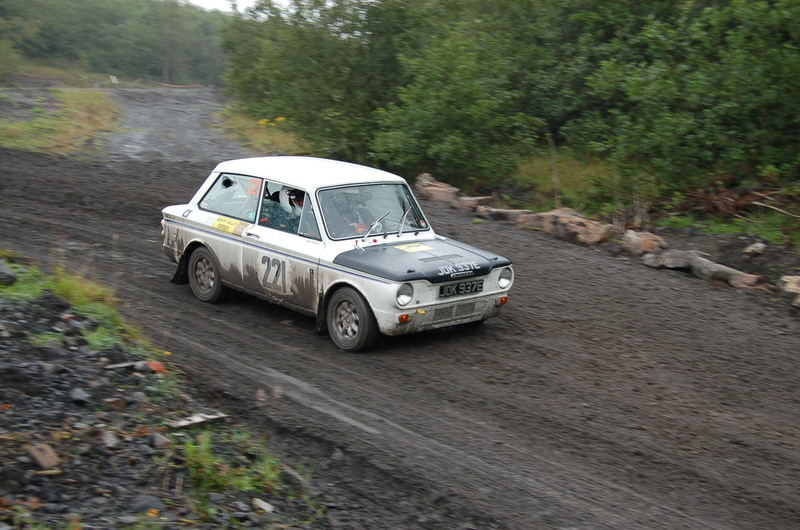 Competing alongside Geoff Taylor in his similarly spec’d Sunbeam Imp we hope that this, our first British Historic Rally Championship round, will mark the end of a string of engine related issues. The 6 stages on Saturday 28th April cover 48 miles within Kielder Forest in the Scottish / Northumberland borders. The rally is for internationals as well as historic cars with so far 48 historics entered of which 8 are in the true historic pre- ’68 class. Look at http://www.pirelliinternationalrally.co.uk/2012/images/PDF/2012%20Carpark%20Map_a.pdf for the stage locations (all on OS Landranger maps 79,85 and 86) but note that the historics only do stage numbers 3,4,7,8,9 and 10. Assuming the rally doesn’t run late, we start at about 07:30 and then do the first three stages before returning to Carlisle Racecourse for service at about 10:20. Be prepared for the last minute panic is my usual advice to newcomers to the sport, and its good advice as far as it goes. Its not always easy to prepare yourself for something that crops up out of the blue at the last minute, but you can guarantee, as eggs is eggs, that there will be a last minute panic. I had sneakingly suspected that really organised and experienced teams didn’t have this problem, but as the years go by, we seem no less challenged by the last minute panic! Anyone who says that cars, especially rally cars don’t have a sense of humour is wrong! Mine, MuddyMoo, certainly has a twisted sense of humour designed to keep us on our toes. In the past four years we’ve done everything from chassis welding to changing A-Frame bushes at the last minute when we should have been loading up. As it happens it seems that the latest member of the Friesian Racing herd is also inflicted with the last minute panic disease, only this time it is terminal. Following a slight missfire at the Longmoor Loco stages just before new year, we took ShammyMoo for a session on the rolling road as we suspected a carburation problem. A compression check later and it turned out that a poorly seated valve was in fact the culprit and a top end engine rebuild was the result. 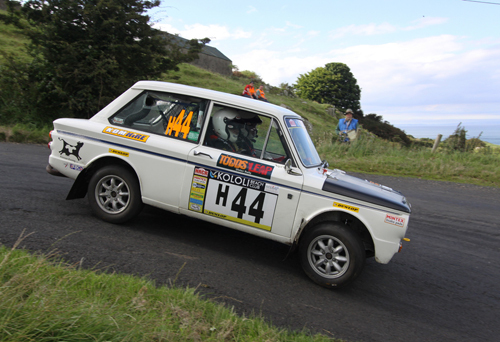 With less than a month before the event, given that the winter modification list was a long one with a run at the Kiloli British Historic Rally Championship in the offing, we had no time to lose in firing the engine back into the car and getting back to the rollers. The second session with Andrew Bradley at Bradley’s Garage in Shipton under Wychwood was equally concerning. This time Shammy’s head cried enough with a hairline crack in the water jacket spraying a fine jet of coolant out.at anything over 7500RPM. Engine out again to get the head welded. Re-assembly was last weekend’s task, the last before heading out to the Bulldog Rally on Friday. Unfortunately, although we got the engine back in and running, it wasn’t running at all well. Having gone through the whole ignition system without curing the problem, our attention then turned to the intake. We then found that the inlet manifold was distorted where it meets the head. We don’t yet know whether this is our problem, but with the cut-off for withdrawls from the event looming at 2100 PM on Sunday night we decided that we would be better off saving the money and taking our time getting to the bottom of the problem. This is immensely disappointing given the amount of effort that Nigel in particular has put into the car during the closed season. 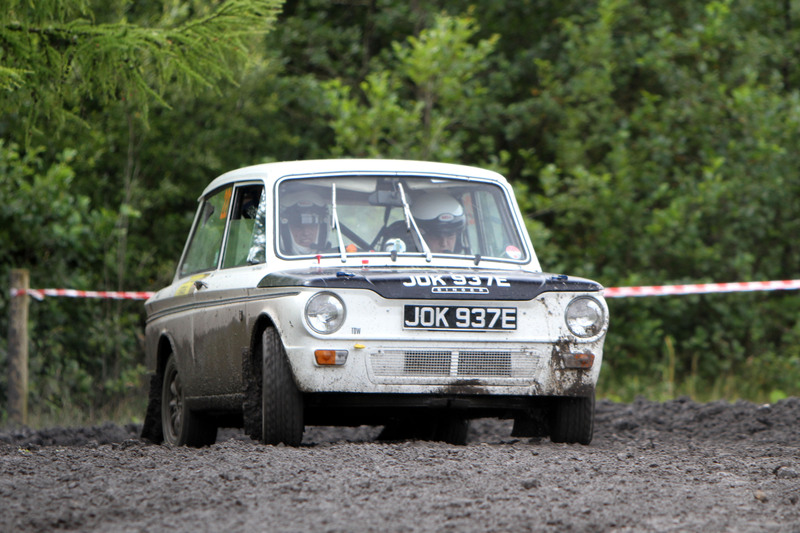 We can’t wait to get out on the stages and take up our side of the two car Imp onslaught on the British Historic Rally Championship. Instead a slightly dejected Nigel and Henry will be heading up to Welshpool to provide support for Geoff Taylor and Steve Greenhill, in the hope that they may be blessed with better luck this weekend. My theory stands – always expect a last minute panic! Usually they can be sorted, but occasionally they will totally catch you out. I guess its one of the things that make Rallying such a compelling hobby, you never know what’s around the next corner! 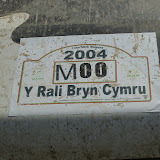 Put ShammyMoo’s smart new Kololi British Historic Rally Championship decals on at the weekend, just in time for the obligatory last minute panic on Monday morning, of which more later.